Investigation Into Prince's Death Reveals Pills Were Hidden Throughout Paisley Park : The Record Assorted opioid painkillers and sedatives — many prescribed not to Prince, but to a friend — were found throughout the artist's home, according to documents newly released today. "Prince recently had a history of going through withdrawals, which are believed to be the result of the abuse of prescription medication." The star of music legend Prince, painted on the outside wall of First Avenue, featured in the film Purple Rain, in Minneapolis, Minnesota, two days after his death on April 21, 2016. 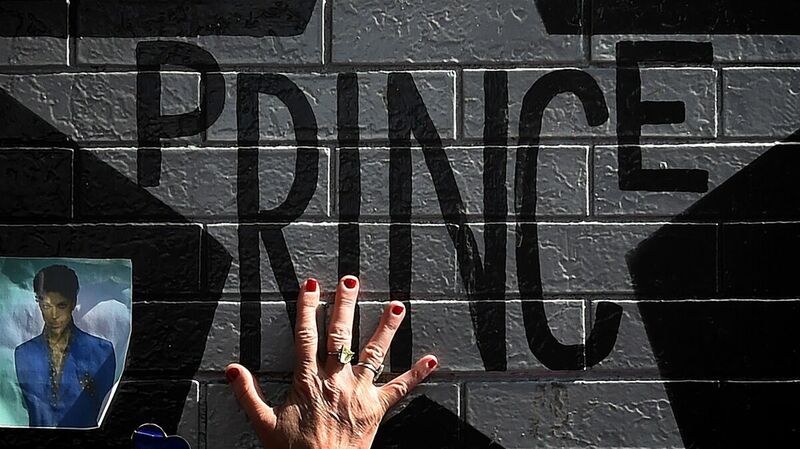 A year ago this week, the artist Prince was found dead at Paisley Park, his home, studio, and party space in the Minneapolis suburb of Chanhassen. Today, a series of search warrants and affidavits from the criminal investigation of Prince's accidental opioid overdose were made public by the Carver County District Court in Minnesota. Dated between April and September 2016, these documents were part of the investigation into how and where Prince obtained a fatal dosage of fentanyl. They also give some insights into the day on which the legendary musician passed away and the circumstances of the weeks leading up to his death on April 21, 2016. Throughout Prince's residence, including in the laundry room and in Prince's bedroom, investigators discovered controlled substances that "were not contained in typical prescription pill bottles but rather, were stored in various other containers such as vitamin bottles," according to the documents. Johnson had contacted Schulenberg to help treat Prince's hip pain. One affidavit states that the doctor met with Prince and prescribed him three sedatives: clonidine, hydroxyzine pamoate and diazepam. However, the prescriptions were made in Johnson's name to protect Prince's privacy, Johnson told investigators. A day before Prince's death, on April 20, Johnson picked up the prescriptions under his name; he told county investigators that "this was the first time he had ever done something like that for Prince." Schulenberg was at Paisley Park, dropping off test results, when police arrived there on the morning Prince's body was found. Schulenberg also told investigators that on April 15, he had prescribed Prince oxycodone, also in Johnson's name. That was the same day that Prince's plane, on a flight to Minnesota following a performance in Atlanta, had made an emergency landing near Chicago. According to The New York Times, Judith Hill and Kirk Johnson were the only other passengers besides Prince on that flight. Prescription medications written to Johnson and dated April 7, 2016 were found in a suitcase with the name tag of 'Peter Bravestrong,' which singer and friend Judith Hill confirmed to investigators was an alias Prince would use while traveling. The medications included acetaminophen/oxycodone hydrochloride, an opioid painkiller. Investigators also noted that the 'Peter Bravestrong' suitcase contained handwritten lyrics for Prince's song "U Got the Look." A computer found near that suitcase in Prince's bedroom was initially overlooked by investigators, until they learned through interviews that Prince did not use a cell phone. Instead, the artist communicated only through email and a landline telephone after his cell phone had been hacked and its information leaked. Jason Kamerud, chief deputy for the Carver County Sheriff's Office, told NPR this afternoon that "no one has been charged, and the investigation is ongoing." An earlier version of this story incorrectly stated that Paisley Park is located in Chaska, Minn. The correct location is Chanhassen, Minn.